Peter Parker is dead and gone, but an entirely new Spider-Man's still slinging webs and fighting crime. Peter Parker is dead and gone, but Spider-Man's still slinging webs and fighting crime. And it's not just a new teenager climbing Manhattan buildings, it's an entirely new crime-fighter, from the colour of his suit to the complexion of his skin. 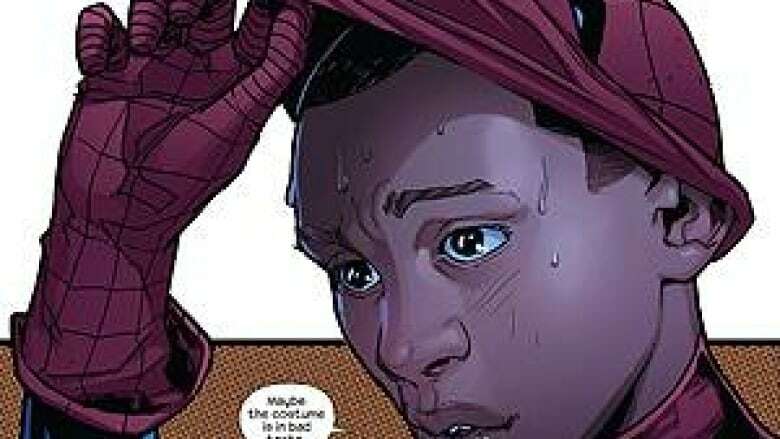 Meet Miles Morales, a half-black, half-Hispanic American teenager who, inspired to do good after the death of Parker at the hands of the Green Goblin, takes flight and has his first fight in the pages of Marvel Comics' Ultimate Fallout No. 4, in comic shops on Wednesday. The Ultimates imprint is separate from Marvel's bigger universe where Parker is alive and well. Writer Brian Michael Bendis, who has scripted every issue of Marvel's Ultimate Spider-Man since it first debuted in 2000 to wide acclaim, maintained a new hero would replace Parker, felled in the pages of Ultimate Spider-Man No. 160 this summer. But as to whom that was a closely guarded secret, until now. Bendis said that the decision came down to the story, to keep it fresh and vital and new. Morales, he explained, is nothing like his predecessor. "He's younger than Peter Parker, he's coming from a completely different background, a completely different world view," Bendis said. "It's Peter Parker's death that inspires this kid to step up." Bendis said his decision was made before comedic actor and screenwriter Donald Glover's efforts to be considered for next year's Spider-Man film went viral. He had talked it over with Joe Quesada, Marvel's chief creative officer. "Joe and I talked about it at great length — what if he was an African-American and how interesting it would be," Bendis said. Later, he saw Glover on the acclaimed television show Community, wearing Spider-Man pyjamas, and knew he was on the right track. P.O.V. :Do you support re-imagined superheroes like the new black Spider-Man? Making Spider-Man a black character is not a publicity effort, it's reflective of an industry keeping pace with modern society, said Axel Alonso, Marvel's editor-in-chief. "As someone who grew up on a steady diet of Luke Cage, Hero For Hire and Shang Chi, Master of Kung Fu, I am personally invested," he said. "This was a conscious decision. Here at Marvel, we pride ourselves on reflecting the real world in all its diversity," Alonso added, adding that Morales' stories would be on par with those of Parker. "Morales' adventures will be fleshed out in the coming months with the start of Ultimate Comics: Spider-Man in September that is being illustrated by Sara Pichelli. Bendis is excited about the possibilities that Morales brings. "I'm now sitting with a pile of legitimately new Spider-Man stories to tell and that is the best news a writer could have," he said. Do you support re-imagined superheroes like the new black Spider-Man?